© 2007 Rowena T. Millado licensed to About.com, Inc.
Sacramentans are lucky to have several choices when buying fresh flowers, fruit, and vegetables from Northern California farmers. 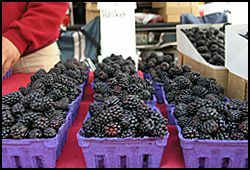 A popular way to buy the agricultural bounty of the Central Valley is at local farmers markets peppered throughout the city and outlying areas. A few are open all year long, while others are seasonal, mostly opening in May and running through October. Some are morning markets, while others operate in the afternoon. Farmers offer a variety of fruit and vegetables, but shoppers can also buy fresh tulips, irises, and other flowers; organic cheeses, artisan breads, and pastries; raw and seasoned nuts; cut and planted herbs; and other specialty food. Before heading to the market, make sure you have prepared for your shopping trip. Once you are ready to go, all you have to do is choose where to start. If you can manage to wake up early on a Sunday morning, make your way to the Sacramento Central farmers market where you’ll find Asian produce, cheeses, olive oil, eggs, and more. Shoppers will find great prices at this Midtown market, which is among the larger markets in the area. Guide Tip: Get here early. Since this is a popular market, on a few of my visits, some vendors ran out of food. Roosevelt Park is among two farmers markets along P Street. Along the perimeter of the park, shoppers can buy vegetables, fruits, nuts, meats, herbs, flowers, baked goods, and cheeses. Just down the street from Roosevelt Park is Fremont Park. Vendors are spread along the perimeter of the park. Guide Tip: Finding a parking space can be a challenge at both of these parks. If you’re lucky, you’ll find a metered spot. Remember to keep track of the time to avoid getting a ticket. Caesar Chavez Memorial Plaza is abuzz with shoppers from area office buildings at this downtown market. The Florin Mall farmer’s market is located at Sears. South Sacramento residents can hop over to the Capitol Mall during their lunch break for pizza, barbecue, tamales, and a variety of food truck vendors. Another popular farmer’s market is located at Country Club Plaza. Shoppers can find that market in the parking lot on Butano Drive. Enjoy this open-air market when the weather is nice. This intimate market features fresh vegetables, fruits, and hormone-free meats. It’s convenient for people who work during the week and like to do their shopping on the weekends. A well-stocked farmers market with fruits, vegetables, nuts, meats, mushrooms, and more.